Maintain discipline on the bus so that the bus driver’s attention is not distracted. Do not jump on or off a moving bus. Throwing objects inside or outside the bus is not permitted. Never stand in front of or behind a stationary bus. Do not run to the bus, walk in a queue instead. Do not tamper or tear the seats on the bus and if found a fine will be applicable. Emergency exit is used only in an emergency situation. Use of this exit other than emergency situation is strictly prohibited. Unruly behaviour like shrieking, shouting and use of foul language, etc. in the bus is strictly prohibited. Courteous behaviour is expected at all times. All students using the school bus are expected to be at the bus stop at least five minutes before the arrival time of the bus. The bus will not wait for late comers. The staff on the bus is authorised to monitor student behaviour. Parents are advised not to hold the bus by keeping their child’s belonging on the bus to confirm the arrival of the child. This delays the bus to reach school on time. Every child is expected to board the bus from their designated stop only. No child will be allowed to board in any other bus if he or she misses their assigned bus. Bus routes are very tightly scheduled in order to get the children and teachers to school on time. The buses WILL NOT wait for late comers either at the stop or at school, in the afternoon. Bus timings/routes may periodically change to help students reach faster/accommodate new students. The buses cannot provide door-to-door service, as this would entail students to spend an inordinate time commuting to and from school. Do not leave a message with the bus driver or matron. Please cooperate with the transport department in this regard to avoid inconvenience to either party or child. No special recommendations will be entertained for change in bus timings. During school vacations/holidays transport will not be provided to students participating in camps at school. Students who take coaching classes or have been detained in school for extra classes will not be provided with the transport facility before and after school hours. Parents are requested not to give any tips in terms of cash or kind to the bus drivers / bus boys and matrons. Parents should refrain from calling the bus drivers while they are driving. Each bus is equipped with GPS system, Fire extinguisher and First Aid Box. Deens Buses are equipped with speed governor as per the requirement of road transport authority, Karnataka. Change of bus stop for a day or week will not be entertained. We do not allow and permit change of bus to go with friends as it’s against the policy of the school and this is for your child’s safety and security. In such case parents are requested to pick their child from the school or from the regular bus drop point. Matrons on the bus shall have the authority to allocate seats to the children. Deens does not follow google map but follow the distances as per the physical checks done by the team which was hired by the school. Also we follow main roads and calculate the distance as per main road and not through short cuts and by lanes. Bus stops, once designated, will not be changed. 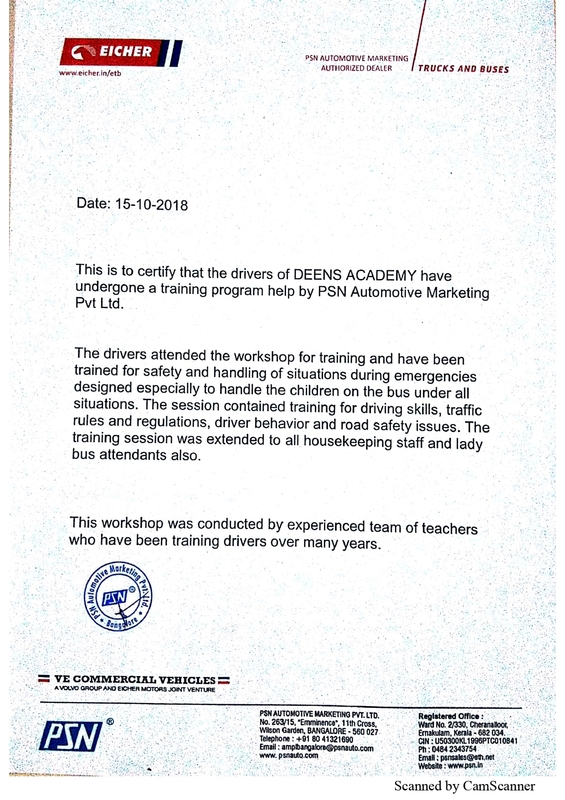 If you need a change of bus route/stop, do notify the transport desk at transport@deensacademy.com. If the bus stop is on an existing route, the change can be made only if seat is available. If the detour of the bus causes inconvenience to the route, the change may not be possible. We do not change or alter routes each year as per new admissions or change in address. The routes are fixed and all buses ply on their designated routes. Parents are requested to select their nearest stop on the existing routes. Grade 1 and above: before 12:30 pm. If you would like your child to return home on his/her own from the bus stop, a written letter shall have to be given to the Transport Coordinator. If the child is being picked up by anyone other than the parents, the designated person(s) should display the Parents ID Card to the Transport Team before picking the child up from the bus. Please inform the Transport Coordinator in advance about the same. The request must be in a written format – mail or note. The policy of the school is to bring the child back to school in case the parent or guardian fails to be present at the drop point to collect the child,within the designated time. The bus will not wait at the bus stop for more than two (2) minutes. The child will be brought back to school, thereafter. The parents will have to collect the child from the school. In case the road or by lane leading to the pickup or drop point is blocked or under repair, the parents or guardians are requested to pick or drop their child at the main road.